Topics: Services, Charges, Services, Simply Business, and Report Abuse. 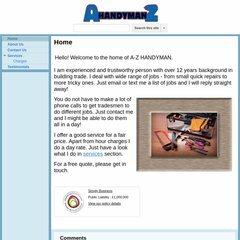 A-z-handyman.co.uk's server IP number is 173.194.74.121. It is hosted by Google Inc. California, using GSE web server. dns083.b.register.com, dns157.c.register.com, and dns229.a.register.com are some of its 4 Nameservers.